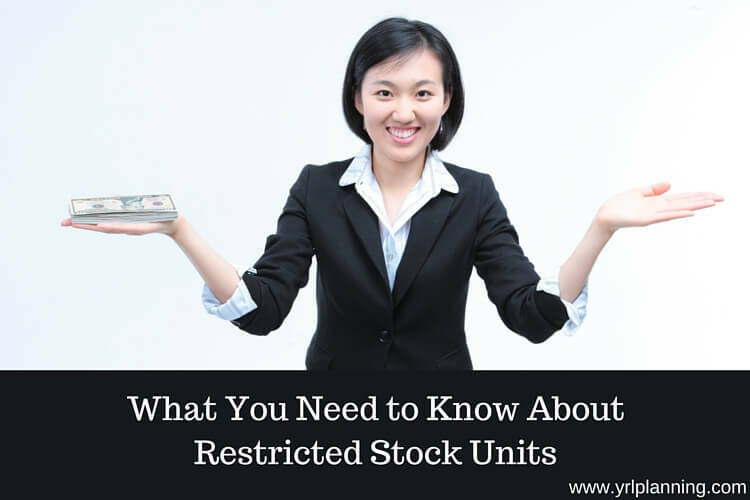 Are you receiving restricted stock units from your employer, but you’re not sure what to do about them? If so, you’re not alone. Restricted stock units (RSUs) are complicated, and very few people know how to make the most of them. If you’re a more visual learner, jump to the bottom of this blog post to watch our video on restricted stock units. Many technology companies like Google, Yahoo, and Facebook, offer employees restricted stock units as a way to recruit and reward employees. Since the RSUs are usually given over time, it aligns employees with company performance as you’ll earn more if the company stock rises in value. It’s also a way to retain talented employees for longer periods of time. You’ll often lose out on your restricted stock units if you leave before the stock vests completely. If your current or future employer offers restricted stock units, it pays to understand how your RSUs work. Perhaps you’re evaluating two job offers, and both employers offer some amount of RSUs. Or perhaps you’re trying to determine if it’s best to leave one company for a great position at another. Depending on the fine print, you might miss out on a great deal of money if you leave too soon. Even a few months can make a difference. Make sure you aren’t leaving money on the table by learning the ins and out of RSUs. A restricted stock unit is compensation given to an employee in the form of company stock. It could be a performance bonus, a signing bonus, or some other reason for compensation. When you’re given the bonus, you’re granted restricted stock units. You don’t receive the stock right away. Instead, you’re given the stock over a period of time as the stock vests. You’ll receive a vesting schedule that shows you how many stocks vest and at what date. When the stock vests, you’ll pay ordinary income tax on the current market value of the stocks. Unlike stock options, once the stock has vested, you’re free to sell the stock for cash right away if you choose. Think of it as a bonus from your company that you can either take as cash or put it into stock. Since you have the ability to sell the stock, should you? Most of the time, the answer is yes. It’s too risky to have both your job — your main source of income — and a large portion of your wealth all relying on the success of one company. Remember the terrible stories of employees at Enron, WorldCom, and countless others during the Dot-Com bubble? If your company goes bankrupt, you’ll lose your job and your nest egg all at once. You’ve worked hard to make the money, so sell the company stock to create a diversified investment portfolio that will help you keep your wealth for the long haul. In fact, if you sell the stock, it’s best to sell the stock on the vesting date. You’ll have already paid tax on the stock as regular income as it vests. If you sell right away, you’ll sell at the same price as the vesting price, and there won’t be any more gains subject to further taxation. If you’ve already missed this window, consider waiting for a year after vesting so you’ll pay a long term capital gains rate on the sale. If you sell the stock less than a year after vesting, the gains will be subject to short term capital gains rates. Since your vesting schedule tells you when your restricted stock vests, and therefore when you’ll be taxed, you can plan ahead to minimize your tax bill. Your company should withhold a few of the stocks to pay the tax bill at vesting. Make sure you read the fine print on this; you don’t want to be surprised with a humongous tax bill come April if your company does things a little bit differently! You can also do additional proactive tax planning to minimize the amount of tax you pay that year. You can save more in a pre-tax retirement plan like a 401(k). If you get a state tax deduction, it’s a good time to put some money in a 529 college savings plan. Perhaps you save up two years of charitable gifts and give it all in one year to reduce this year’s income. If you work at a company that grants restricted stock units, make sure you understand the fine print on your RSUs. It will help you properly evaluate job offers, give you guidance about leaving a company when you have unvested RSUs, and help you make the most of your current compensation.